"The trophy would mean the world to us"
Only three teams have won the Women’s Challenge Cup twice in the 24-year history of the competition. This season, Rocasa Gran Canaria have the chance to match the achievement of Buxtehuder, Nimes and Mios Biganos, who all won the title two times. 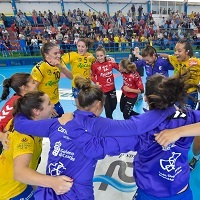 For the second time in the last three years, the Spanish side have reached the competition’s final and only MKS Perla Lublin of Poland are standing between them and the trophy. The first leg will be played in Spain on Sunday at 13:00 hrs (live on ehfTV.com), while the decisive return leg in Poland has been scheduled for next week Sunday, 13 May, at 20:15 hrs (live on ehfTV.com). Gran Canaria have established themselves as one of the top sides in the competition in the last few years. As defending champions, they were also on track for the final last season but were ultimately edged by Lokomotiva Zagreb in a hard-fought quarter-final. There are only six players left from the team that won the competition two years ago following a 62:54 aggregate win over Turkish side Kastamonu. But most of them are seasoned professionals, including Silvia Navarro Gimenez, the 39-year-old goalkeeper who also won the Women’s EHF Cup in 2009, when she was donning the Itxako shirt. One of the most decorated Spanish players ever, now at the zenith of her career, the goalkeeper has another chance to add to her trophy collection. “Of course I won medals and titles back in the day, but now everything looks more important. Nowadays success is harder to get as a Spanish team and the trophy would mean the world to us,” Navarro tells eurohandball.com. The Spanish side eliminated five other teams, including a do-or-die rematch with Lokomotiva Zagreb in the semi-finals. After an aggregate 51:51 score, Gran Canaria advanced based on the away-goal rule. “I think it is a bit of a surprise to qualify for a European final. Every European competition is complicated, because there are very good teams involved. I think it is a big surprise for all of us. Now all we have to do is to win the trophy,” Navarro says. ✔Desde hoy y hasta el próximo domingo se pueden adquirir sus 🎫entradas para la 🤾🇪🇺 Final Europea en nuestro pabellón donde jugaremos contra el 🇵🇱MKS Lublin. ✅El precio de las mismas será de 10euros en Tribuna y 5euros en los Fondos de Pista. The only team which could prevent Gran Canaria from winning a second Challenge Cup trophy in three years are MKS Perla Lublin. The Polish side, a former Champions League participant, eliminated another Spanish team on their way to the final as they beat Rincon Fertilidad Malaga in the quarter-finals. “Winning our second title in this competition in such a short period of time would be a dream. Any Spanish international success is cherished and remembered here,” says the 39-year-old goalkeeper. “We are a team that fights until the very end. But we know our rivals are very tough, they won comfortably in the semi-finals. But we are ready. We are not afraid of them but we respect them,” she says. As Lublin have not been beyond the quarter-finals of a European Cup competition before, Gran Canaria might look like having the upper hand going into the final. What about the future for the team from the Canary Islands? Navarro is upbeat about the prospect of playing in Europe once again next season. “We want to win the domestic league, where we are in a tough battle for the title (with Bera Bera and Guardes), and achieve great results in Europe next season, too,” Navarro says. The goalkeeper will be a player to watch against Lublin. Her unorthodox style can put pressure on the opponents and her experience in tough games could prove decisive. It will be the fourth European final for Navarro. She lost the Women’s EHF Champions League Final with Itxako in 2011, but won the Women’s EHF Cup with the same club in 2009 and the Women’s Challenge Cup with Gran Canaria in 2016.